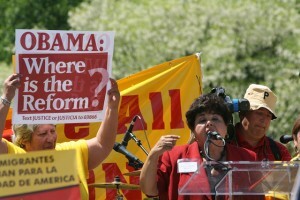 Home »Immigration»Does Obama Have a Latino Problem? Does Obama Have a Latino Problem? President Barack Obama named a Latina to the Supreme Court — the first in history. He’s appointed more Hispanics to the federal government than his predecessors ever did. And yet Obama has seen his support among Latinos steadily dwindle ever since he won the presidency. What gives? You’ve probably read in the media about how with its anti-immigrant stance, the GOP is alienating Latinos. But at the same time, Latino support for Obama has also dropped from 69% to 48% in less than two years. Sure, Latino voter turnout helped deliver the presidency for Obama the first time around. With increasing anger and dissatisfaction with the White House, though — especially the absence of immigration reform — Obama should be anxiously eyeing his falling poll numbers. When it comes to immigration reform, it’s clear that speeches won’t do the trick. Obama’s gilded words aren’t helping those fighting Arizona’s anti-immigrant law gain any traction. Meanwhile, the fact that the $600 million border security bill passed without the Democrats successfully demanding any concessions from Republicans might just be the last straw. That’s why some pundits — like Jorge Ramos, the most popular Spanish-language newscaster in the United States — are saying Obama has a “credibility problem” with Latinos. They’re blasting him for failing to fulfill his campaign promise of passing an immigration reform bill within a year of taking office. Across Spanish-language media, people are openly criticizing the White House’s enforcement-now, enforcement-forever immigration policies. Of course, that credibility problem is not just limited to Latinos. With Obama’s job approval rating teetering at a mere 45%, Obama’s favorability has dropped among most demographics, and most significantly among white independents. Growing progressive disenchantment with Obama and gibberish attacks from the White House in return won’t help inspire voter turnout from the base. President Obama and leading Democrats point to GOP obstruction as an excuse for inaction on immigration reform — which rings rather hollow, given that health care and financial reform legislation have managed to win approval. What many Latinos see is a President unwilling to fight for the issues most important to them. Obama may still be the favorite presidential contender for 2012. However, if the White House thinks that they can bring Latinos to the polls with little more than empty promises to offer, they have some major rethinking to do.